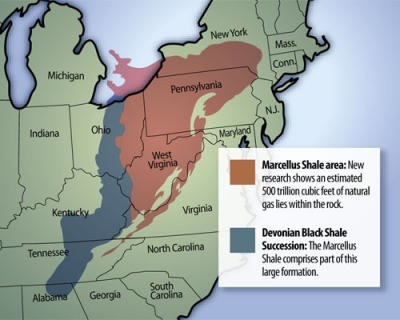 In light of the fact that we are starting our discussion on minerals, I figured what better, and more contemporary a topic to blog about than hydraulic fracturing the Marcellus Shale deposits in New York, Pennsylvania, Ohio, and West Virginia. The phrase hydraulic fracturing, or as it’s commonly known “fracking,” is undoubtedly a sensitive issue and one that many of you are very passionate about one way or another. 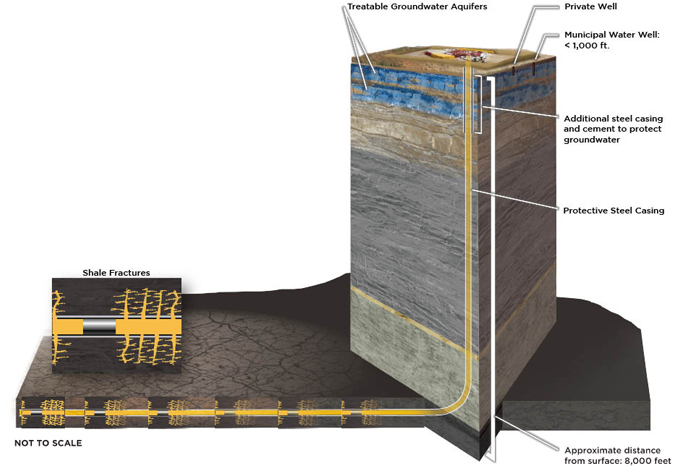 For those of you that are unfamiliar with hydraulic fracturing (which I’d be very surprised if you were), the process involves injecting a mixture of water, sand, and chemicals, to make shale deposits deep underground more permeable. Well advances in technology have made the production of previously inaccessible reservoirs of natural gas economically viable. On the other side, you have individuals and businesses that assert the economic boom that drilling the shale formation will provide the region will be extraordinary. In this “rust belt” area, where the relics of our industrial past take the form of shuttered factories, a boom in mining would bring jobs to the region, bring unemployment down, and revenue to state coffers. As a soon-to-be-attorney who is interested in this field of litigation, I try to stay on top of the media coverage of the Marcellus Shale formation. What I’ve found is that I am inundated in reports of the dangers of hydraulic fracturing, until this past summer as I was reading the news paper. I came across the following editorial that rose above the din. The following is the link. For the sake of space I didn’t include the text of the editorial in this posting. I highly recommend that you read the editorial and compare it to what you have already heard in the media. Whether you are for the development and exploration of the Marcellus Shale formation or against it, I think what we all can agree on is the fact that neither side should demonize the process without a sufficient scientific basis. Personally, I am for the exploration and production of the formation, so long as it can be done SAFELY. If the claims of water contamination materialize, then I believe we need to take a step back and figure out how we can solve that problem. Whether it is through better water or well casings, changing the chemical composition of the fracturing fluid, different disposal techniques etc., safety must remain a priority. In a time when many people are struggling to get by or are unemployed (Unemployment Rates: NY 8%, Ohio 9.1%, PA 8.3%, and WV 8.2% from http://www.bls.gov/lau/), Marcellus Shale will add jobs, significant new tax revenue to the states as well as helping to make domestic energy abundant and affordable. These deposits have the potential to rejuvenate the region, but it is important to remember the enormous responsibility that those seeking to produce the formation must bear. Of course the pro-drilling article appears in the notoriously laissez-faire WSJ. What do we expect them to say? Did you see that photograph? The one with the chemical-laced water spraying out all over the ground? Oh wait they put a tarp down—oh my mistake, I meant a “sophisticated containment system.” How would we all react if bottles of Dasani or vitamin water or whatever suddenly said “pure natural spring water, now with 0.005 percent antifreeze!”? At least New York won’t allow open-pit storage of—why don’t we all just admit it?—carcinogenic produced water. Chemical spills will of course inevitably occur, and we’ll have to clean them up. This will invariably cost dearly in public funds. We also seem to be having trouble finding public treatment facilities capable of treating drilling waste. But I suppose that’s a just a minor technicality. And yes, the 2005 energy bill did by and large exempt hydraulic fracturing from federal oversight. Normally if you try to inject 20,000 gallons of toxic chemicals into the ground (does it matter that it’s mixed with four million gallons of water? ), the EPA gets on your case pretty quick. But here, regulatory responsibility lies almost entirely with the states. The EPA is just getting around to even studying whether fracturing poses potential risks to ground and surface water sources. Don’t worry, we’ll have an answer by 2014. In the interim, we can just rely on the defunded, depopulated DEC to keep an eye on things. They’ll do what they can of course—but I fear they can’t do enough. Bottom line is, this partisan editorial is dismissing out-of-hand any and all objections to large-scale natural gas drilling in relatively populated areas in the interest of—wait, did they say liquified natural gas export? But I thought this was about domestic energy independence? Or is it just about the natural gas industry making money regardless of the environmental and economic damage that results? Seriously, ask yourself—how well would you tolerate a natural gas well across the street from your otherwise peaceful farmhouse? This industry is on track to change the face of New York State. I fear, in the aftermath, most of us won’t very much like what we see. In a nutshell, this is the story of a group of neighbors who leased their farms to a natural gas drilling outfit in Pennsylvania. Soon after the wells went in, their animals started dying. Then their kids got sick. When the doctors found arsenic and benzene in the kids’ urine, the family abandoned their home. The drilling company and the Pennsylvania Department of Environmental Protection deny any wrongdoing. I guess the cynical moral of this story is, if the energy company doesn’t offer you enough lease money to pay off your mortgage and walk away from your house, you’re taking your life in your hands. Is this what we want to see happen in our communities? I recall we discussed the Coase Theorem in class on Monday—there’s certainly an economically efficient resolution for situations of this sort, but it’s likely not the solution most of us would want for our families. Nobody’s denying we don’t need new sources of energy, but what good does it do if we poison ourselves in the process? One last thought. Is it not extremely troubling that the people left holding the proverbial bag here are among the least able to afford it? From an environmental justice standpoint, it’s kind of reprehensible. Your concerns about open pit storage are understandably an issue that would need to be addressed before full scale drilling takes place. And as the process evolves, these concerns SHOULD be addressed on a collective, open, and transparent basis between environmental agencies and companies as they arise. With regards to funding of these agencies, fees and taxes on these sites could go directly to monitoring the operation. Furthermore, the treatment of used drilling fluid could be another pre-requisite to licensing/permitting. That is, to be allowed to drill, you must demonstrate that you have the capabilities to treat the waste fluid. This cannot, and should not fall to the federal government. I think it is also overtly cynical to say that companies will do whatever they want regardless of the impact on the environment. Yes, businesses make money, they are not a charity, but they have a vested interest in the community that both buys their product and works for them. On top of that, it makes sense in an economic and public relations stand point to run a tight ship, because the consequences, as we have seen in the gulf spill, can be devastating. Just look at the continued costs to BP, $20 Billion+. The story presented in that NYT article is terrible and I sympathize with those individuals. However, there was no scientific basis for the correlation that the author would like the reader to draw. The author simply juxtaposed their symptoms with the fact that drilling was also taking place. What I do agree with is if it the drilling activities turn out to be the cause, that Range Resources is held fully responsible and that their actions and procedures for handing the drilling fluids are investigated. But I do not think it’s intellectually fair to use an anecdotal story to characterize an entire industry or process. And with respect to your comment on Dasani with anti-freeze, I probably wouldn’t buy it then. I agree entirely with your point about funding—unfortunately, New York doesn’t have a severance tax on gas production. That means no tax revenue flows to the state from gas extracted from New York wells. The DEC’s DSGEIS admits costs associated with permitting, oversight, and road reconstruction would likely have a negative financial impact on the state. So yes, by all means, let’s ensure drilling companies at least pay enough in severance taxes to cover the inevitable mediation and infrastructure costs associated with unconventional gas extraction. We shouldn’t allow gas drillers to externalize costs. It’s not fair to the citizens of the state to socialize risk but privatize gain. I respectfully object, however, to your characterization of the scenario described in the New York Times article as “intellectually dishonest.” Sounds more like Range Resources knew it was leaking chemical wastewater into the environment but took no serious action to stop it. When EPA first looked into possible deleterious effects of unconventional gas drilling on drinking water resources, they turned up a lot of stories like the Haneys’. Unfortunately, when EPA tried to substantiate the complaints, state environmental protection agencies frequently had no records, had refused to investigate complaints, or had done so only months after the complaints were lodged. For an informative discussion of EPA’s 2004 report, see Hannah Wiseman, “Untested Waters: The Rise of Hydraulic Fracturing Oil and Gas Production and the Need to Revisit Regulation,” 20 Fordham Envtl. L. Rev. 115 (2009). Endemic, in other words, is this disturbing tendency to hide behind proximate cause and pretend all is well. If one of the big problems with unconventional gas drilling is that it’s difficult to establish causation when things do go wrong, why don’t we subject hydraulic fracturing to strict liability? That way the companies who are undertaking to drill with the expectation of profit also assume the risk of potential mishap. If companies then refuse to drill because they are unwilling to assume that financial risk, then so be it. In my view, strict liability would be an entirely reasonable method of ensuring a little environmental justice. How many brownfields do we have scattered about waiting to be cleaned up on the taxpayer’s dime? Again, if we’re going to allow this industry to develop in New York, why wouldn’t we take steps to make sure the public’s not left holding the bag? A few observations in response to the first comment. First, horizontal drilling and hydraulic fracturing are both sophisticated processes that take place in a highly controlled environment. For most, the only oil and gas production they’ve ever seen is oil gushing from the ground in films about the west. There Will Be Blood, anyone? This is simply not the case in modern unconventional natural gas extraction. Second, liners and chemicals. In Pennsylvania, liners in surface impoundments are mandatory and subject to strict state regulations. See 25 Pa. Code § 78.56-78.63. New York’s decision to require containment tanks is commendable. Such tanks provide further protection against spills and leaks. We encounter a majority of the chemicals used in hydraulic fracturing every day. For instance, diluted acid is used in swimming pools, friction reducer is used in candy, pH adjusters are used in soaps, and oxygen scavengers are used in food and beverage processing. U.S. Dep’t of Energy, Office of Fossil Energy Nat’l Energy Tech. Lab., Modern Shale Gas Development in the United States: A Primer 56 (2009). Further, the dilution that occurs when these chemicals are mixed with water for fracturing is important. Most substances are harmful in high concentrations. Third, DEP inspectors play a prominent role during all stages of drilling and fracturing on well pads in Pennsylvania. In fact, the fees producers pay for drilling permits fund additional DEP staff and resources. In New York, the DEC plans to implement a similar program. Finally, this is a business, not a group of people with a vendetta against the environment. It doesn’t make sense for the bottom line to pay hundreds of thousands of dollars in fines for noncompliance on a one million dollar well. Further, each instance of noncompliance provides fodder for the arguments of a very vocal opposition. At the end of the day, operators have absolutely nothing to gain from not running a tight ship. Take it from someone who grew up on some of that bucolic farmland overtop the Marcellus (where oil and gas drilling has occurred for over a century), it’s going to be okay. In response to the original post, I think natural gas exploration would do great things for the Southern Tier economy. When Eliot Spitzer ran for governor in 2006, he compared Upstate to Appalachia. (http://www.nytimes.com/2006/03/22/nyregion/22spitzer.html) By allowing natural gas drilling, much needed jobs and revenue would be pumped into the struggling local economies. I understand and share the strong environmental concerns; however I believe that the Governor and DEC will ensure that all precautions are taken to limit or quash any potential damage. The reason for this is that I don’t think Governor Cuomo would want to alienate his entire liberal base by allowing uncontrolled, dangerous drilling. Therefore, if fracking is allowed, I think it will be subject to strict oversight thus benefitting the local economy while ensuring a safe environment. Good grief, I’m never trick-or-treating in your neighborhood! Which candies are the ones with the benzene? Or diesel? Toluene? Poison doesn’t stop being poisonous just because you mix it with a lot of water. If these chemicals are so safe, why won’t companies disclose the chemicals they’re using? Note the proposed New York regulations still don’t require full disclosure. Regardless, if hydraulic fracturing as an industrial process is so sophisticated, why does it need to be exempt from the Safe Drinking Water Act? Pretending there are no or minimal negative effects just makes it harder to regulate effectively to ensure public safety. Also, it remains to be seen if, how, or to what extent fees or—shudder!—severance taxes will be used to offset some of the costs associated with regulation, remediation, and infrastructure repair. If you’re from New York, you may recall we were on the verge of shutting down half our state park system a couple of years ago for lack of funding. The DEC’s not exactly flush with resources and staff right now. Our capacity to enforce the regulations we’re in the process of drafting remains a point of considerable concern.